Cuneiform - The first written communication did not appear as words, but pictographs. That is, images used to represent objects. Probably (though not definitively) the earliest form of writing was Cuneiform. It is a generic term used to represent several writing systems. 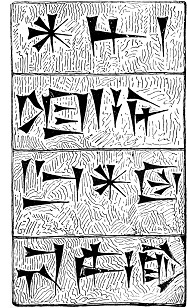 But the first Cuneiform writing originated in the Mesopotamian region of Sumeria (coinciding with Sumeria being the first civilization). From there it spread to other city-states and even traveled beyond Mesopotamia. As time passed, it evolved from pictographs to symbols, described as wedge-shaped and impressed on clay tablets. Evidence points to writing beginning in the late fourth millennium B.C., roughly the same time as the start of the Bronze Age. As writing advanced, symbols were grouped to represent concepts as well as objects, and new ones were created to expand vocabulary, while older ones were dropped. Eventually, symbols were replaced by letters (see Phoenician Alphabet on the Phoenician time line) and Cuneiform died out around the 2nd century AD. The alphabetic writing and language that replaced Cuneiform in the Mesopotamian region was Aramaic, used by the Assyrians and Babylonians starting around the 7th and 6th centuries BC.